Bobby Dundas, Viscount Melville, has achieved many milestones in his life, from playing polo in the World Cup to conquering the Atlantic. A look at the man behind the mallet. He looks a bit like Matthew McConaughey, doesn't he?" It was a nippy Sunday afternoon at the Jodhpur Polo & Equestrian Institute grounds, and the subject of the conversation was a Sahara Warriors player who was then engaged in a showdown of pure horsepower with four opponents from the Jodhpur Polo Team II. The ones discussing him were a couple of elegant ladies, wearing wide hats with diamonds, and sipping slowly from wine glasses held delicately between their slender fingers. Suddenly, the crowd erupted in a roar of excitement. The man in question was now racing down the field on a chestnut horse, his polo mallet skilfully guiding the ball towards the Jodhpur team's goal post. "Yes, Bobby does look like him," agreed the second woman after a pause. "Lucky Matthew." Indeed, while he may not hog as much space on newsprint, there is a lot more going for 30-year-old Bobby Dundas, a.k.a. Robert Henry Kirkpatrick Dundas, than The Wedding Planner star. An English aristocrat who holds the title of the 10th Viscount Melville, he is a sportsperson who has represented his country in the world cup, an adventurer who has travelled the high seas, a philanthropist with a warm corner for the underprivileged, and - more importantly - the propagator of a sporting event that certainly deserves greater recognition across the globe. However, for a blue-blooded aristocrat whose roots go back to 1802, the man is sorely lacking in pomposity. And what's more, he loves India in all its rural hues. "This visit, as part of the British Polo Day, is my first to this country. I have never seen a culture this diverse and vibrant. Then there are the bright colours and the food; everything just hits you in a very nice way." So, has he seen the Taj Mahal yet? The Viscount shakes his head. "But I did visit the Mumbai slums. You see, I would rather visit the slums and witness how the other side lives than go sightseeing to places that I can check on the Internet. For me, Bishnoi villages hold more lasting memories than the Taj." Indeed, an environment of deprivation is no stranger to Bobby, who recently made headlines by participating in the world's toughest ocean endurance rowing race from the Canary Islands to Antigua. "We rode 3,000 nautical miles through some of the biggest storms I have ever seen. It was all about survival; at one point, two of my teammates were even swept overboard by a wave. We were all polo players and close friends, but we ended up fighting over everything - from sharing food to taking turns to row. It all ended well, though. We came second out of sixteen teams, and we got to see whales, sharks and some very amazing fish." But, while the Viscount regards the journey across the Atlantic as the hardest and most memorable thing he has ever done, polo remains his true love. "My mother loved horses, and so I was raised with them. I got my first pony at the age of three, and I started playing polo for my school in Gloucestershire at sixteen. I started playing professional at eighteen, and I have been playing ever since. In time, I went on to play for England in the European Championship at Rome and the World Cup at Mexico." What's more, Bobby's sport even helps him rub shoulders with royalty - quite literally. "Prince Harry? I played with him through school and after. He's a good player, better than his brother, and I like to consider him a good friend. We have a lot of mutual friends, and our paths cross a lot." Quite a charmed life, would you say? Bobby doesn't agree. "While I can't deny that it's fun, it definitely isn't easy. As with any other sport, there are demands to fulfill. You have to work hard and ride about eight to ten horses every day." He pauses, then breaks into a grin. "But, on the flip side, it does bring me to beautiful places like India." Bobby Dundas was in Jodhpur to participate in the British Polo Day. 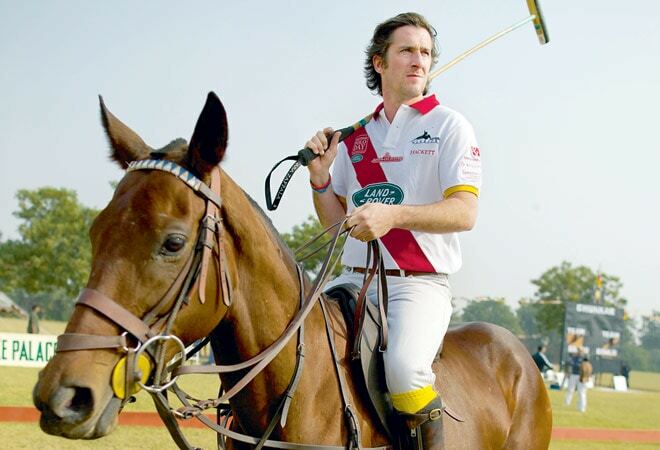 >> Played for the English team in the Polo World Cup-2008. The championship, however, was won by Chile. >> Has 12 horses, his favourites being Lucero (Bright Star in Spanish) and PJ, a chestnut mare. >> The boat he rowed through the Atlantic was called the Tiny Dancer, named after a song by Sir Elton John. >> Next, Bobby and his team plan to conquer the Indian Ocean by boat.